A very special global sisterhood day! Home / Adventure / A very special global sisterhood day! Promptly at 9am Ang Dorje was at the Annapurna hotel to do the final check of my gear list. 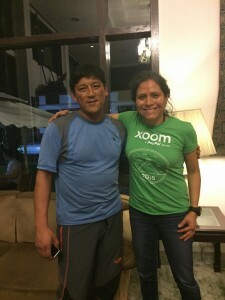 As he inspected the gear in detail and made the list of the 2 missing items, the 8,000mts pants and a small thermos (for the record: the ones I brought were too big); We agreed to a 7pm final pick up of my duffel bag with the Everest. After the gear check, I got very emotional. Most of the gear that I have brought for this journey I have collected through this incredible experience of 10+ years climbing the 7 summits. The realization that I was ready to send my gear to climb Everest made the journey of climbing Everest real. The last several months have been extremely consumed with all the preparations for the journey with the girls and my own personal struggles. I think that somehow there was a safety or excuse about being so focused on the overall preparations that I might have intentionally blocked the anxiety of climbing the tallest mountain in the world. Well with the “D” or better said “E” day here, letting tears flow was a healthy relief. By 10:30am our Nepali Courageous girls had arrived to greet our American girls. 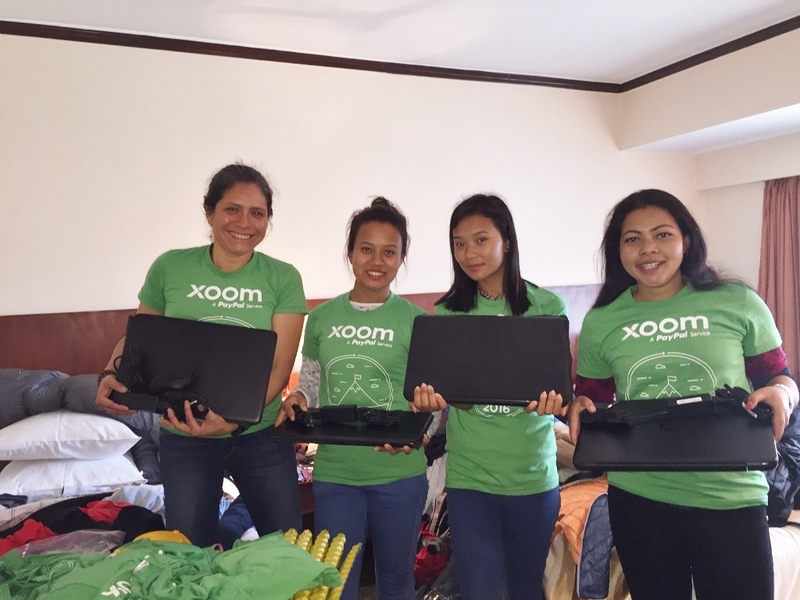 Paola (one of our SF Courageous girls) had generously brought gifts for our Nepali girls who had a lot of fun appreciating them. Our plan was to have brunch and then for all of us to head to the Shakti Samuha shelter and say hello to a very sweet group of young girls and women. To make our Brunch even better, Petra Huber, our iRest instructor, joined us. 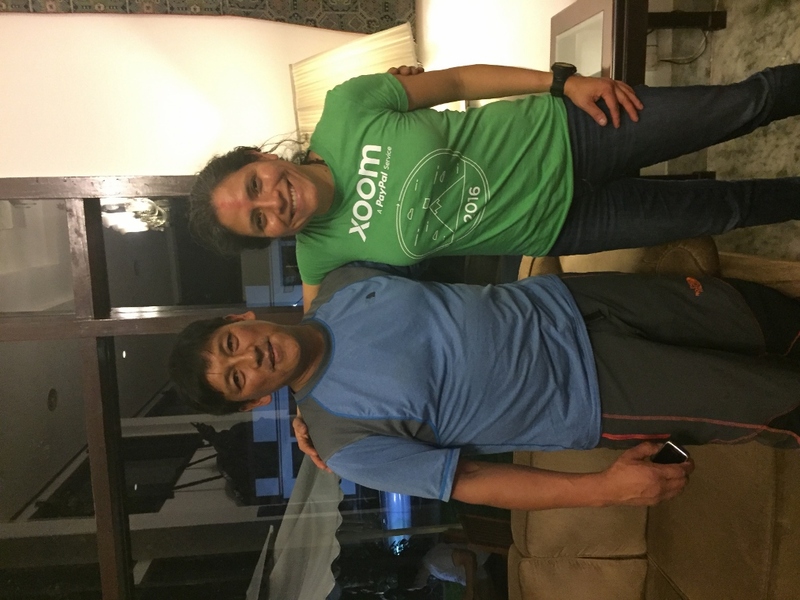 Petra had agreed to held 2 iRest sessions to get our bodies and minds ready for this very tough upcoming journey trekking up the Himalayas. After brunch we left for a visit to the Shakti Samuha shelter. This was a very special journey for me because on my last visit to them last November, I had promised that on my return before heading back to climb Everest, I’d bring with me their blessings. We were sweetly greeted by the staff and girls who gave us a beautiful ceremonial scarf of good luck. As we went through the mandatory introduction of everyone, our Nepali hosts shared with us the excitement to meet our American girls and how special it’d be for them to bring them and guide them into the Himalayas. 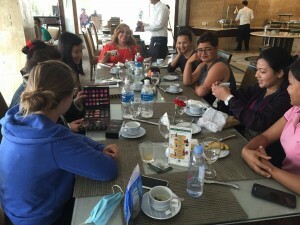 The beautiful blend of our Nepali and American girls was really special. Both Paola and Jess were moved by the generous and kind words and intentions of our hosts. We laughed a lot and it was sweet to witness a special magical event with the rest of the girls sharing similar experiences. It just simply amazed me how distance and culture where bridged when a loving global sisterhood was in place. I gifted the shelter with a special clothing donation I had received from very dear friends in Menlo Park; as well as 4 laptops that I had brought with me as part of our first PayPal grant for the building of the first computer lab at the shelter. Prashanthi Ravanarapu -our Courageous Girls’ Chief Opportunity Officer- who has been developing the next stage in their educational and life skills advancement and this was our first milestone (more developments to be announced). 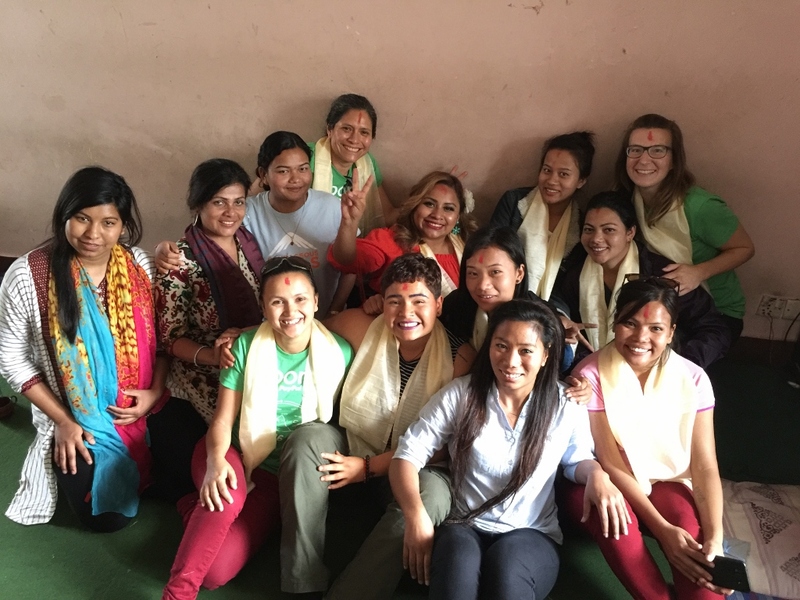 We spent about 3hrs in the Shelter and to wrap our visit, I asked if we could organize a special circle with all the girls, as I personally wanted each of the girls to bless the ceremonial scarf I had just being given and to get their blessing in form of a hug for me to take to Everest. Going around the circle hugging each girl was a very special moment to experience. Once again more tears, but a beautiful feeling of healing and love. Jetlag started to kick in and after a very late lunch/dinner, we all had our first iRest session and that got us ready for bed. Next day would be a full one as we had to do gear check and final shopping and preparation for the whole team. Treat of the day: Spending time with some amazing courageous young women and to be so fortunate in receiving their blessings.